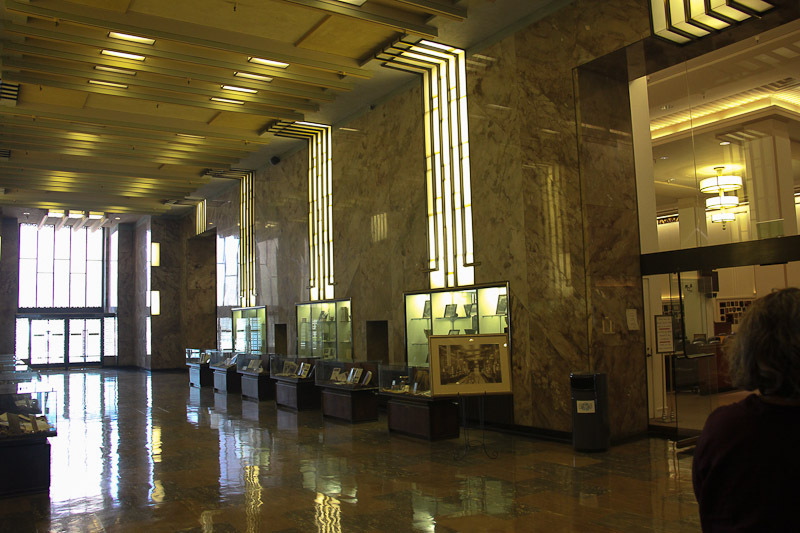 July 28, 2012 - Today's adventure brought us to the historic Bullocks Wilshire building in Los Angeles. 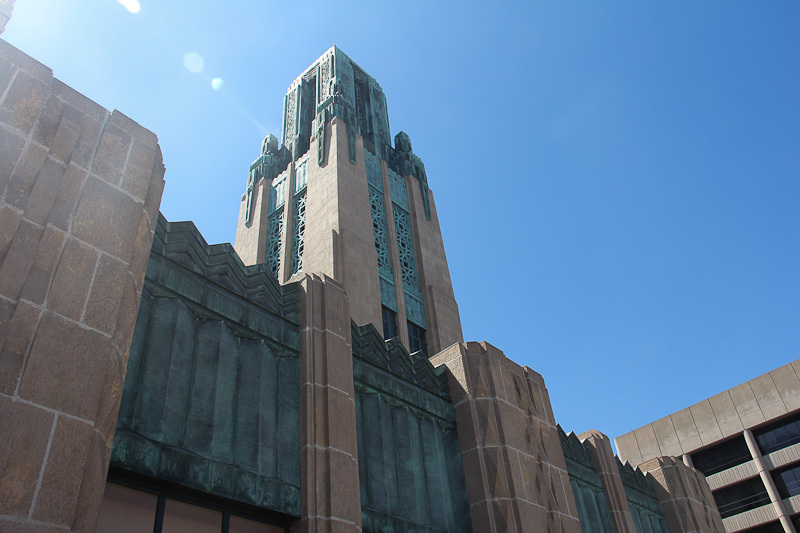 This building opened in 1929 as a luxury department store and was continuously operated for sixty years. The building size is roughly 230,000 square feet. 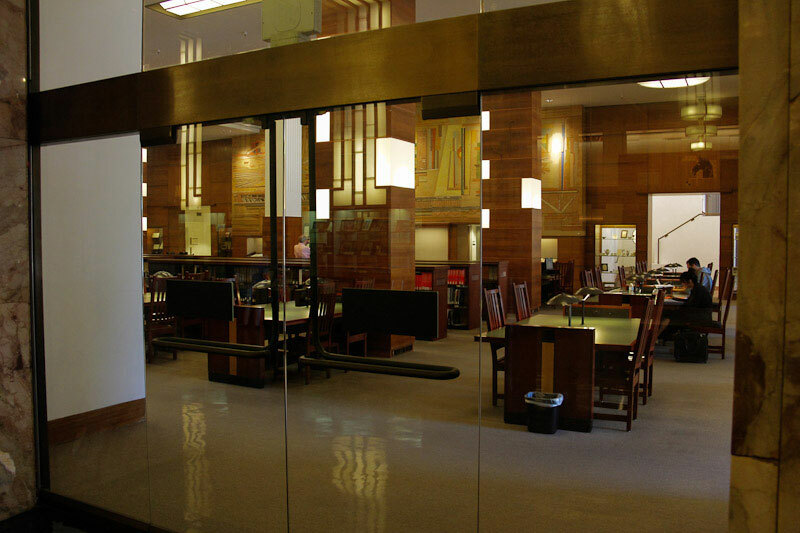 In 1994, Southwestern Law School purchased the aging Art Deco structure, and set out to convert it into a dynamic academic venue, while retaining its historic character. Southwestern purchased the land and building for about $10 million and has spent about $20 million for its restoration. The main entrance is at the rear of the building, under the protection of the porte-cochère, where valets parked the cars of the patrons. 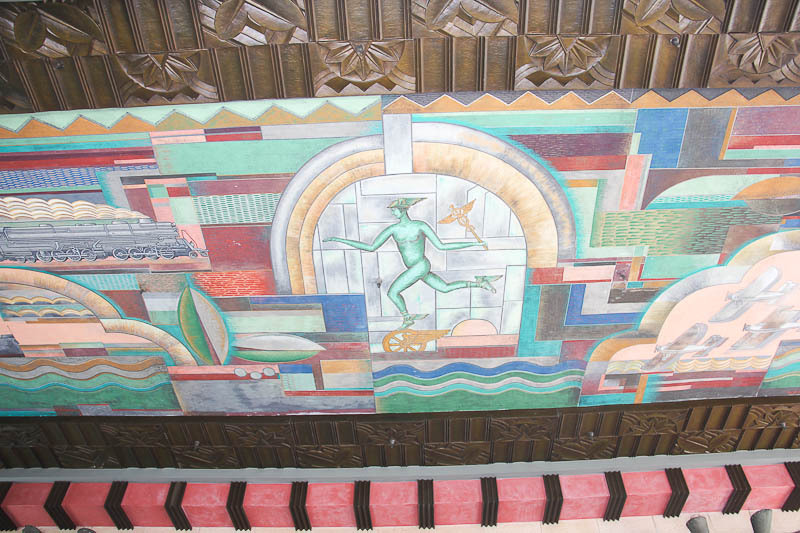 The ceiling of the porte-cochère is a massive mural. The main salon upon entering the store was where perfume was displayed and sold. 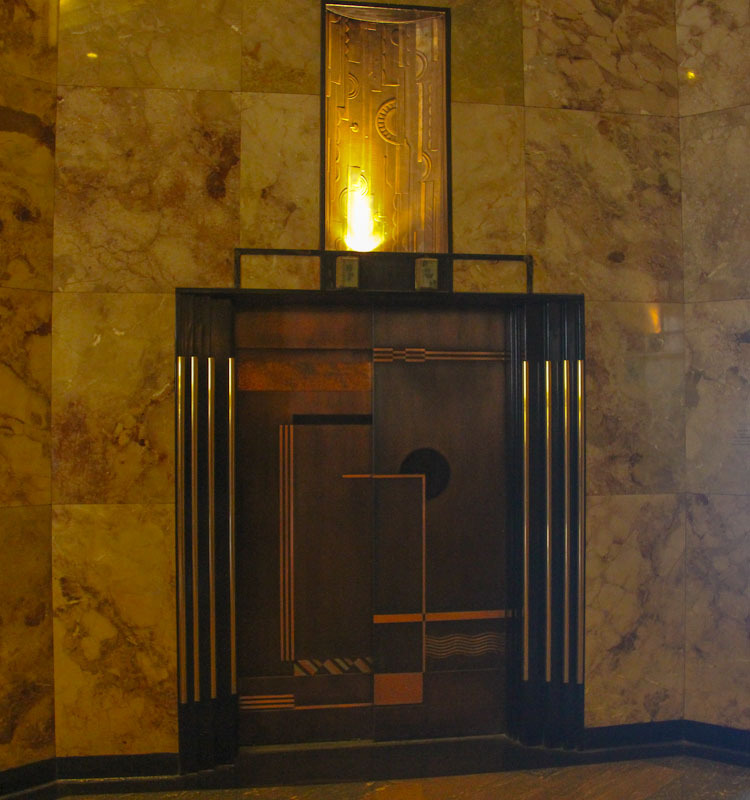 One of the elevators serving the upper floors. Former sales areas have been restored and now are utilized for classrooms, study areas, their law library and other academic purposes. 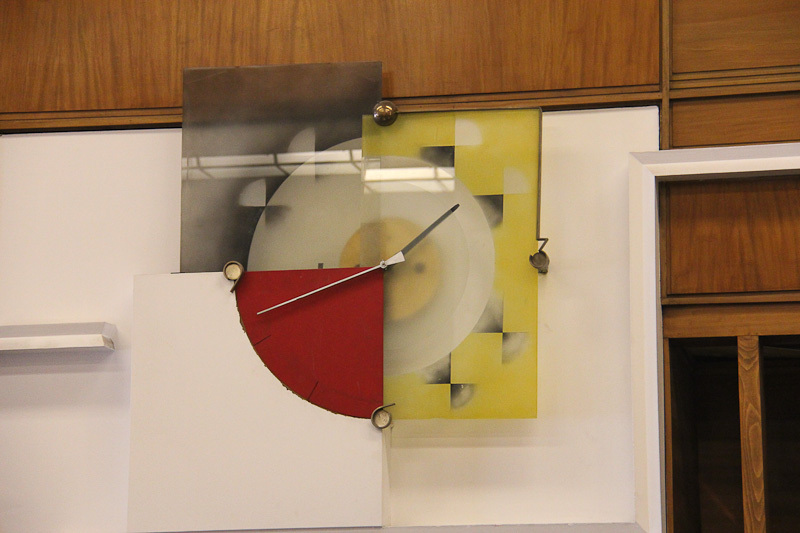 Bullocks had over thirty clocks designed for them and most have been restored and are fully operational. 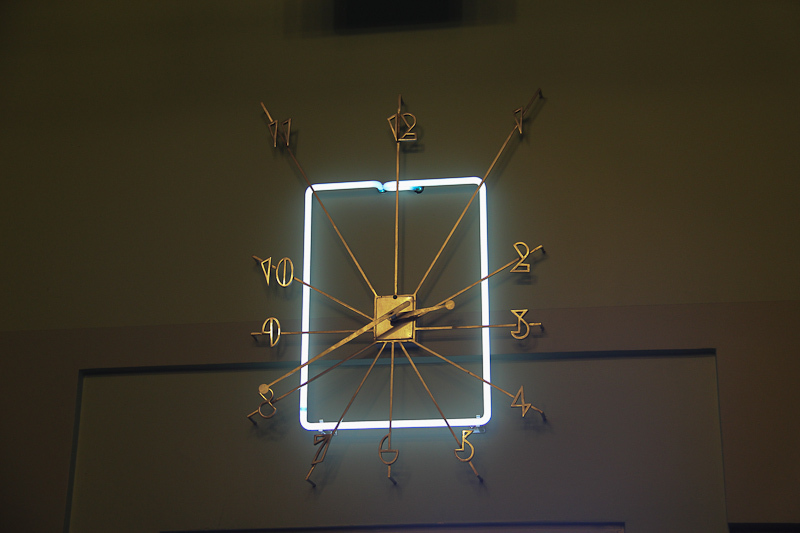 Our docent told us that the best guess for the clock below is that the hours from 6:00 to 9:00 weren't highlighted since those times represented hours when the store was closed, and thus no one would be there to view it. 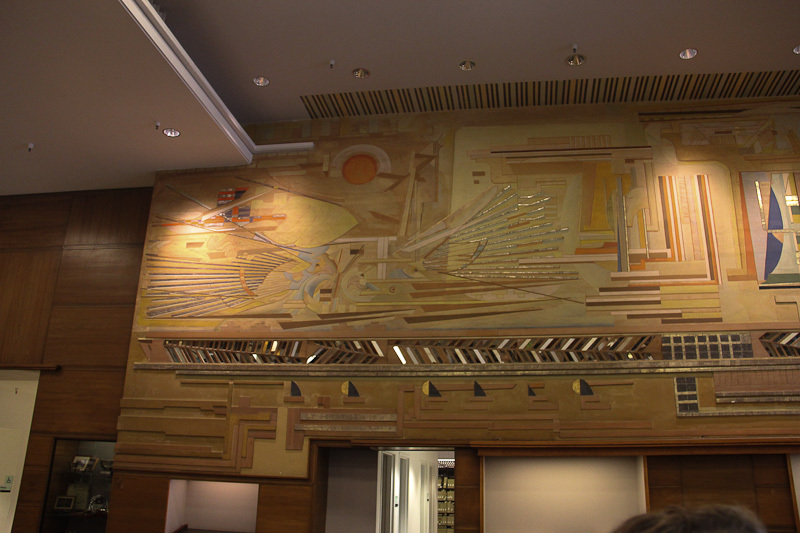 There are murals in most of the rooms. Some are painted and others are in relief like this one. 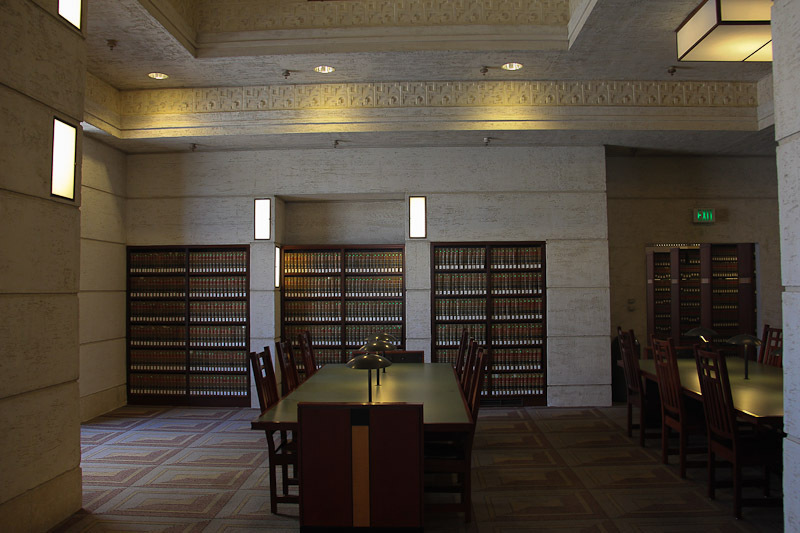 This former selling area is now part of the law library. 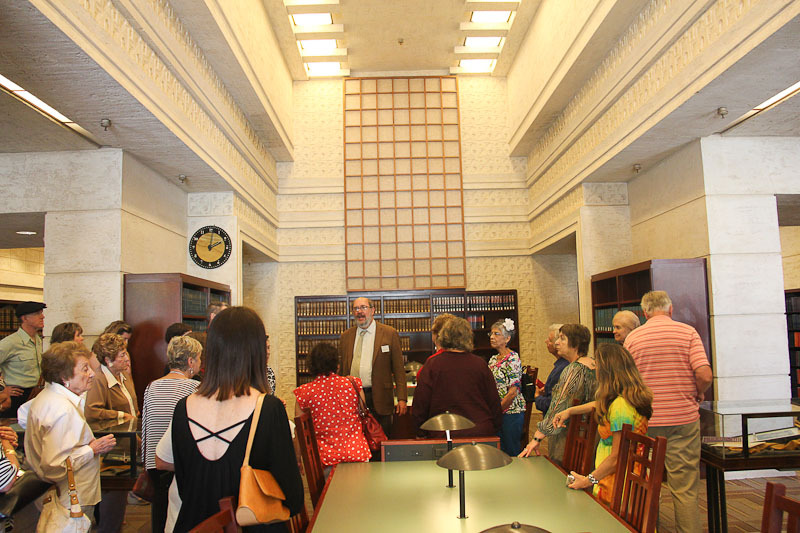 This is also in the library and the gentleman in the suit and tie was our decent for the tour. Notice another clock over his right shoulder. There were many individual "designer" salons here, which was a first back in 1929. 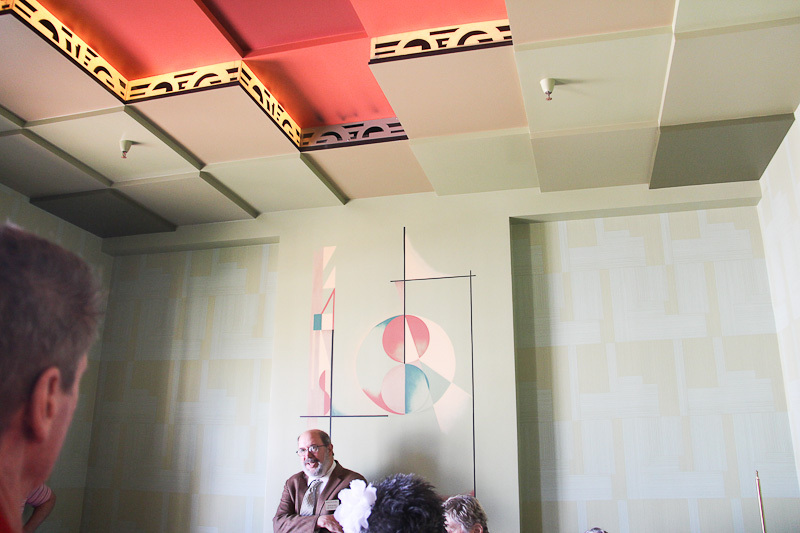 This ceiling is in the former salon of a Hollywood costume designer. There were several designer salons here that were not open to the public. Select customers requested, or were invited to, private shows of particular designer offerings. 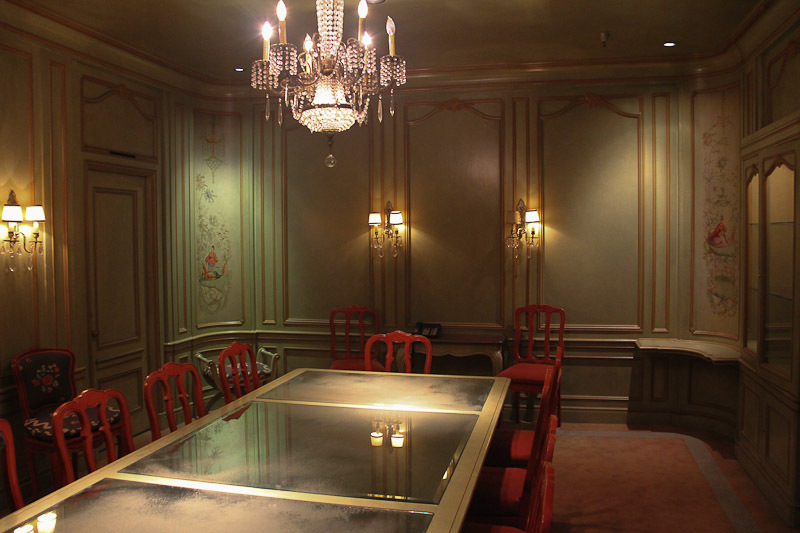 This is the French Room where those affluent patrons were shown the latest fashion offerings. This was the Coco Chanel salon. 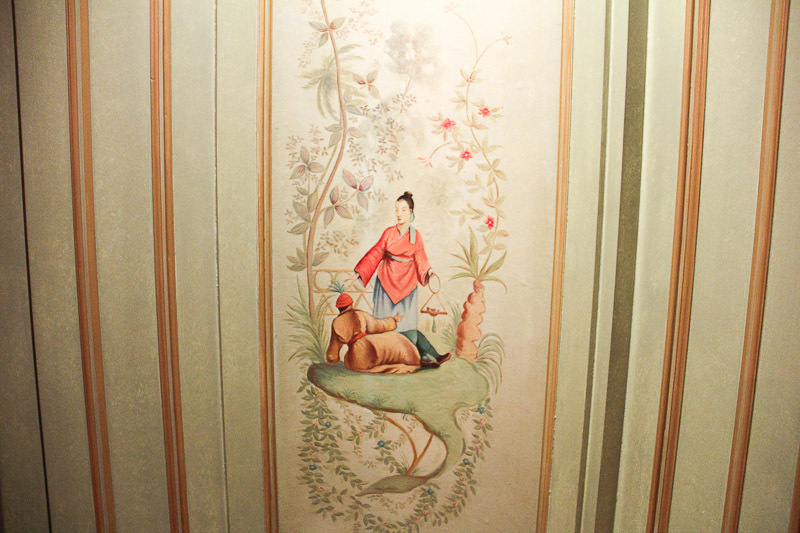 And this is a close up of one of the painted corner panels in that room. This is another beautiful example of one of their Art Deco clocks. 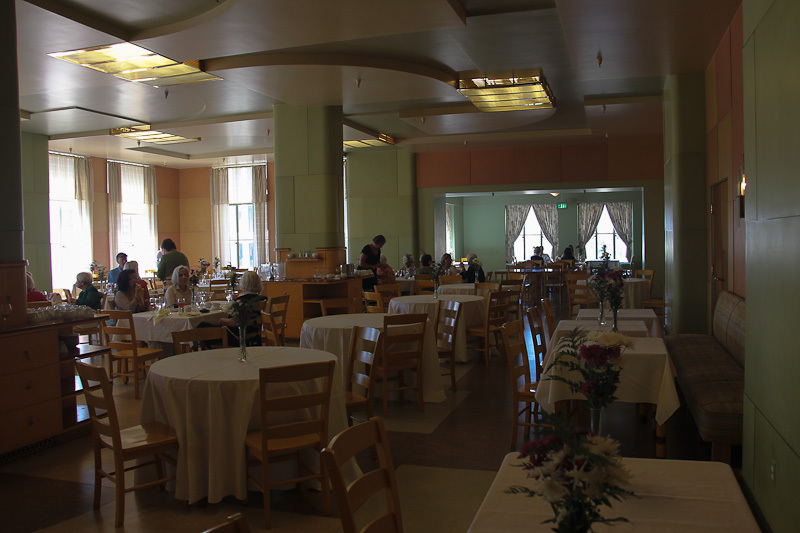 Patrons relaxed and ate in the elegant Desert Tea Room on the top floor. 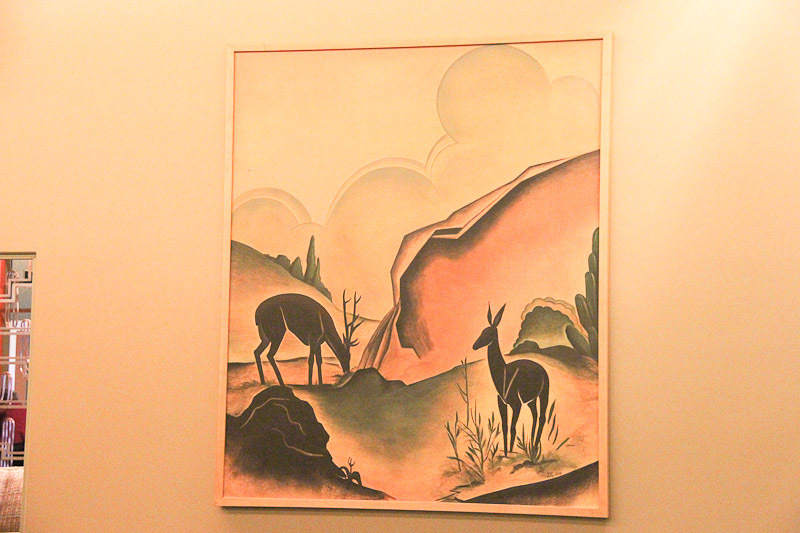 This wall painting is in the lounge area where patrons waited to be seated in the Desert Tea Room. 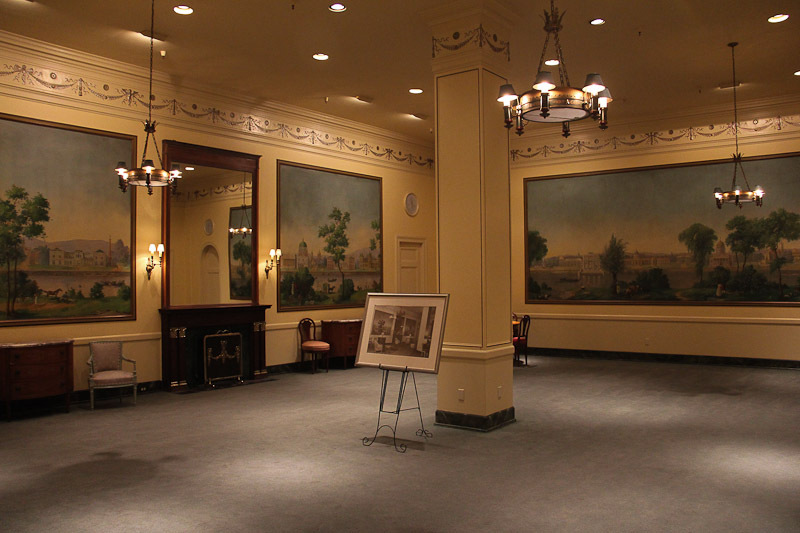 This room was the exclusive "men's only" private lounge, called "Tower Five for Men Only." Here models would parade around the seated gentlemen such that they could decide what to buy their wives or girlfriends. Or maybe both? Who knows, but it's sounds a little suspicious to me. I think Bullocks may have generated more under garment sales here than ready to wear. 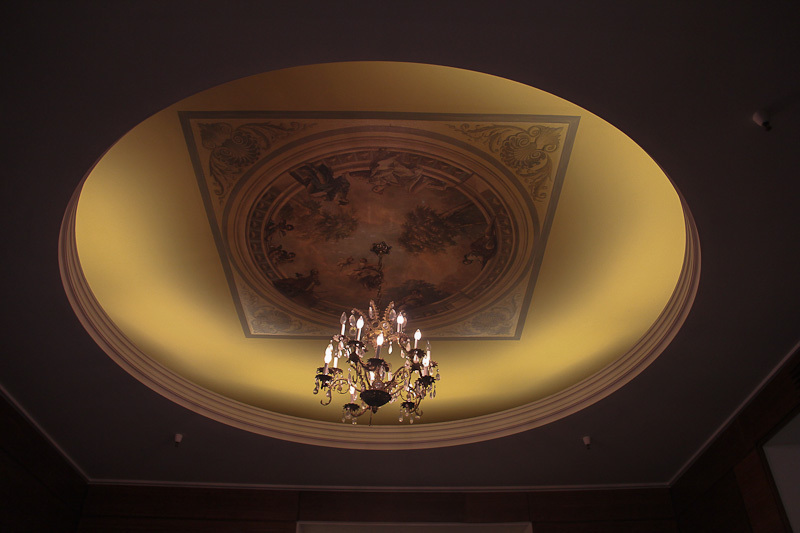 Whatever happened here, it occurred under a beautifully appointed ceiling. This is the private office of John G. Bullock. 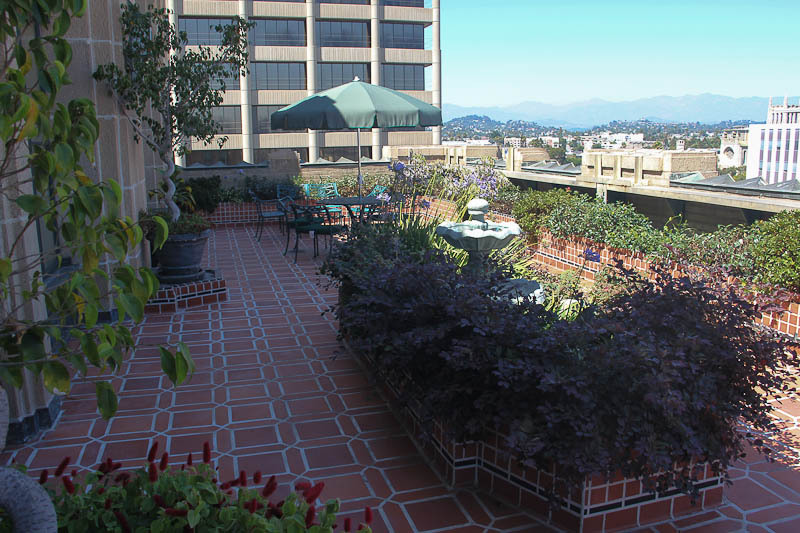 It is also on the top floor (the fifth floor) and it has commanding views of metropolitan Los Angeles. 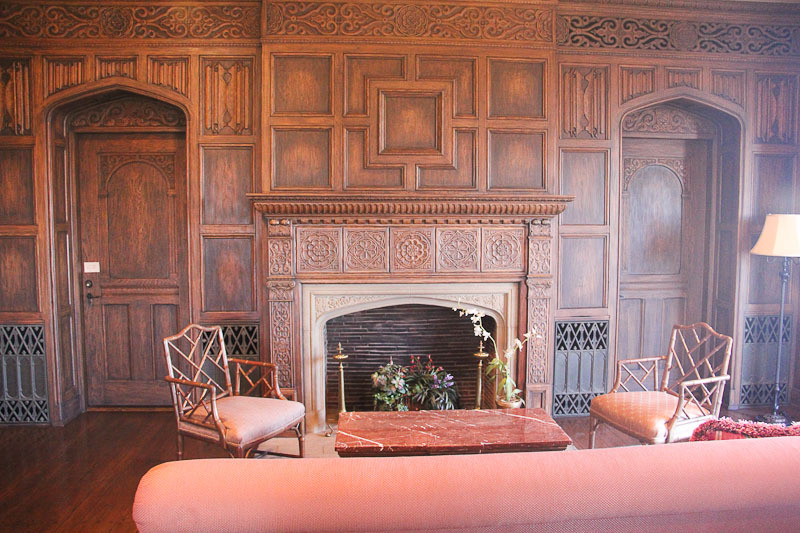 This was Bullock's private patio that adjoined his office. 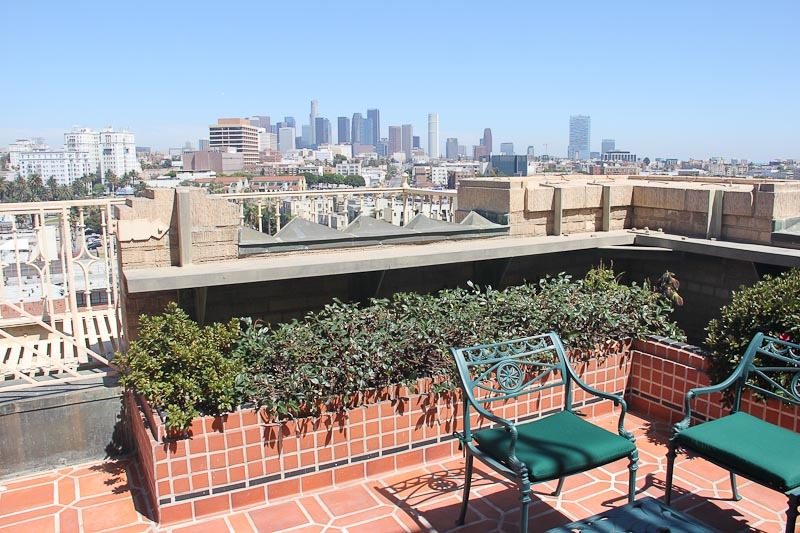 And his view of downtown Los Angeles. And finally, this is a view of the tower, as seen from Mr. Bullock's patio. We loved the tour and were glad we were able to get on the list. 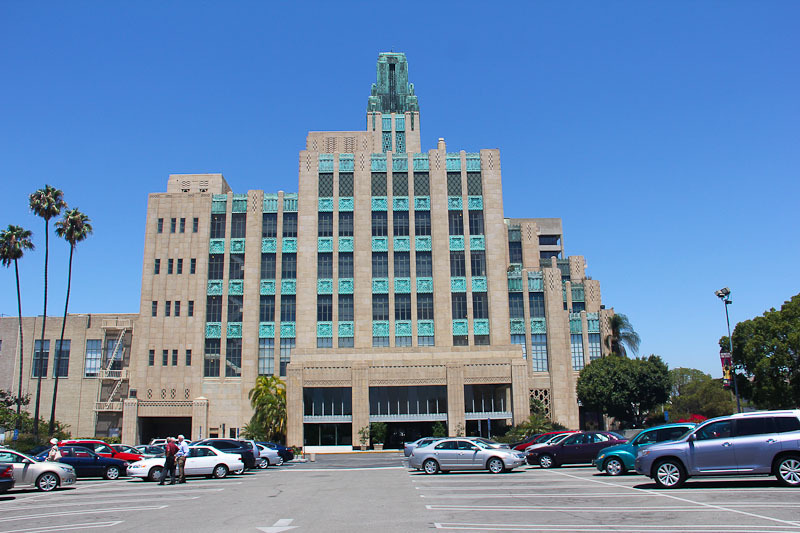 It was a long day since we began at the Los Angeles Farmers' Market, then had lunch at a forgettable Panini restaurant on Wilshire and then coffee in the Larchmont area before our tour began at 1:30 PM. However, after the tour, we still had time to visit the Donut Man in Glendora. 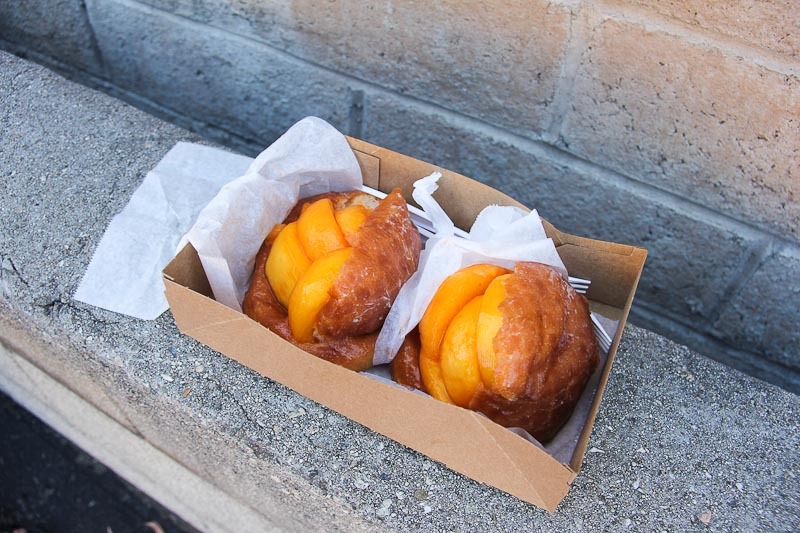 The peach donuts just went on sale the day before and we each had one. They were as good as the strawberry donuts we had there on another adventure.